The emergence of nanotherapeutics is attributable to the integration of nanotechnology, recombinant DNA technology, and synthetic organic chemistry with medicine for treating critical human diseases in a more efficient and specific molecular approach than therapy with conventionally-designed and formulated drugs. Nanotherapeutics: From Laboratory to Clinic comprehensively discusses the current shortcomings for delivery of classical (small) drugs, macromolecular therapeutics, and recombinant vaccine via the common intravascular and extravascular routes. This book describes the synthetic/chemical engineering methods as well as recombinant, hybridoma, and phage display technologies to fabricate different types of nanoparticulate carriers and drugs. It also reveals the diversified approaches undertaken by harnessing nanotechnology to overcome the multistep extracellular and intracellular barriers and to facilitate the development of novel strategies for therapeutic delivery and imaging. The author elaborates on the preclinical and clinical trials of potential nanoparticle-based products in animal models and patients and the approval/commercialization of nanotherapeutics, addressing all relevant human diseases. 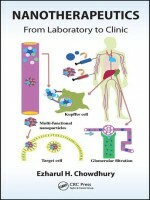 A focus on the above issues in a concise but illustrative manner fills the gap between the laboratory findings originating from the research on identification of cellular and systemic barriers of classical and macromolecular drugs along with development of strategies for fabrication and testing of nanotherapeutics, and the clinical outcomes emanating from the testing of the selected potential nanotherapeutics on patients of particular diseases. The book also fills a gap in the existing literature between the design and development of diversified nanotherapeutics for various purposes and the investigation and evaluation of potential barriers and resultant therapeutic efficacy of those nano-medicine formulations.